Bike Commuting is on the rise throughout the world, and you’re thinking about joining the masses who ride their bike to work! You’ve arrived at the right website to help you get started. 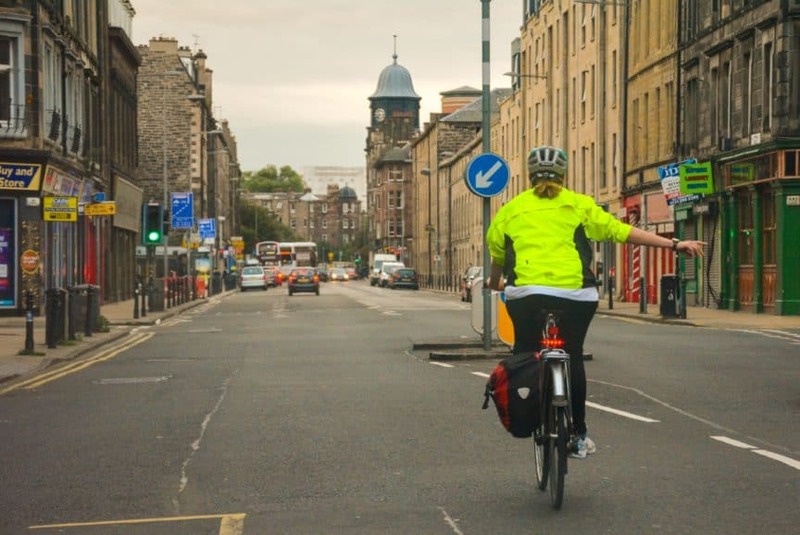 In this clear guide we’ll answer all the questions you might have about starting to bike to work. The good news is that starting out as a bike commuter isn’t difficult. Most people not only have the ability to do so, but also the right gear. What kind of bike should I get for commuting? The truth is that you don’t need a special bicycle to start bike commuting. You do need a bicycle that fits you and is comfortable. Many people never even try riding their currently owned bike to work, because they feel like they don’t like its the right bike. Once again – you need a bike that fits you (isn’t too small or too big!) and that is comfortable for you. For multiple years I rode a steel framed Schwinn bicycle that was heavy and didn’t have much range in gearing. And you know what? It worked. Don’t get caught up thinking you need the latest and greatest bicycle on the market. If you already own a bicycle whether it’s a mountain bike, road bike, or a hybrid give it a shot. Don’t spend lots of money on something new until you know that bike commuting is for you. If you don’t own a bike we would recommend checking your local Craig’s List or bike shop. You can also get a decent used bike for $150-250 dollars. One of the beautiful things about bike commuting is that the more you do it the better shape you’ll be in. Even if you wouldn’t classify yourself as a “fit” person you can begin. My wife started a new job. When she first started she had a very difficult time making it up the hill, and would pedal a quarter of the way up before dismounting to walk the rest. Now after daily commutes she can make it all the way up the hill and only feel a little out of breath! Riding to work will get you in shape over time. Just start where you’re at. How far is too far to ride to work? This is a hard question to answer, because of the numbers of factors that go into it. Are you ok with getting sweaty? How physically fit are you? Do you have lots of time to get to work or not so much? It’s such a complicated question that we wrote an entire post to answer it. You can read it in entirety here. The short answer is that we would argue 5-10 miles is the perfect distance for a bike commute. It’s not a terribly long ride which will reduce the amount of sweat you produce and the time it takes to get to work. In addition, it’s not so short that you barely start pedaling before you’re already there. There are commuters who only have to go a mile while others who have chosen to do a 20 mile commute everyday. The answer depends on you and your circumstances. What if I get sweaty riding to work? This is always one of the first questions that new commuters ask, and it is a fair question. No one wants to work all day smelling and looking like they got out of a sauna. If your employer has a shower for employee use than this is an easy answer. Ride as hard as you want, and take a quick rinse off shower when you get to work. If a shower is unavailable you’ll want to reduce the amount of sweat by dressing in a manner to not sweat a lot. I would also recommend not wearing a backpack, because it will increase the chance of your back sweating. You should also have a wash rag at work and a change of clothes. This way when you arrive to work. Even if you’re sweaty you can wipe down with a rag, and clean up the “problem” areas. What about bike commuting in poor weather? Even nightmare weather doesn’t have to stop you from commuting by bicycle. We wrote an entire article detailing how you can even bike in the rain. Poor weather isn’t ideal (unless you’re one of those crazy people who love riding in the snow/rain), but it can be easily overcome. You will want to decide whether to embrace the rain and change when you get to work or if you should gear up in a way so that you arrive to work dry. Extremely cold weather can be a bother for bike commuting, but can be easily conquered with appropriate clothing. Wear clothes that will keep you warm, but also allow your body to breath as you don’t want to get sweaty. You’ll also want to remember that you will heat up as you pedal. Where will I store my bicycle? So you’re going to be riding your bike to work, but you can’t just leave it parked on the street. There’s a few options for bicycle storage to keep ride safe and protected. One choice is to leave it outside locked to a pole or permanent fixture. You could also ask your employer if there’s a place inside your work facility to store your bike while you work. Another solution is to see if there’s a local parking garage or bike shop nearby that you can store the bike at during the day. For a more detailed answer to this question check out our bike storage for commuters guide. What essential gear do I need as a bike commuter? Our philosophy towards bike commuting is that you should just start before you think about purchasing more gear. The only “essential” gear you’ll need is a helmet. We don’t recommend riding without a helmet unless you want to crack your dome open. There’s lots of helmets to choose from. We personally like this one. Other than owning a helmet and a bicycle you are good to start riding. 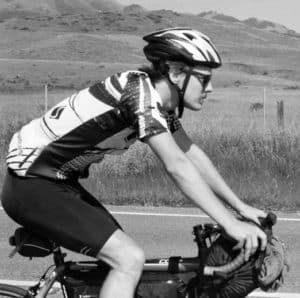 If you’re looking to become a more prepared you can always look into purchasing panniers, a light, or some bike-friendly clothing. We will say it again – all you really need to get started is a bike and helmet. Don’t overthink this one! Riding on a road with vehicles can be intimidating. Here’s a few pointers on how to bicycle on the road safely. Ride with the flow of traffic. Don’t ride against it. Follow traffic laws, yield to pedestrians and other vehicles. Do not pass other cyclists on the right. Pass them on the left. Keep a safe distance between you and other cyclists/vehicles. You want to have enough room to navigate or stop. A general rule of thumb is to have one bike length for every 5 miles per hour you’re going. You want to make sure there is also plenty of space between you and the curb. Don’t ride on the sidewalk. Be predictable. Be visible. Be aware of your surroundings. Use hand signals for turning. If you’re on a busy road or highway brace yourself for passing traffic. Pull over if there’s 5 cars behind you to let them pass. It’s ok to use the car lane if there’s no bike lane, but keep to the right side. If you’re looking for more safety tips check out this article with 24 bike safety tips to keep you safe and sound. 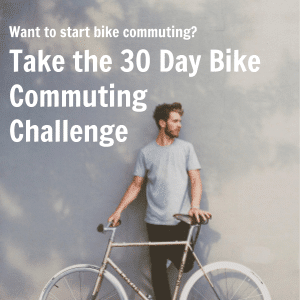 I hope that I was able to help you get started as a bike commuter! These are the most common questions that people have about bike commuting. Please poke around the rest of this website as it’s full of guides, tips, and motivations to start riding your bike more. 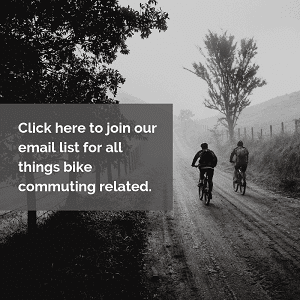 If you have a question about bike commuting that isn’t on this guide feel free to contact us! We’ll do our best to help you out.